Q: It is reported that the ROK and the US defense ministries announced their decision to end the annual springtime joint exercises Key Resolve and Foal Eagle, which, according to their statement, reflects their desire to reduce tensions and support efforts toward complete denuclearization of the Korean Peninsula in a final, fully verified manner. What is China's comment? A: We have taken note of relevant reports. The political settlement of the Korean Peninsula issue is currently at a critical stage. China commends and supports all positive measures conducive to easing tension and fostering mutual trust. We hope all parties concerned can continue to send goodwill signals, meet each other half way and make joint efforts to advance the dialogue process. Q: A question on the two Canadians detained in China. I'm just wondering if you have any information how was it logical that one Canadian speaking to another Canadian in China amounts to espionage or leaking of state secrets? A: According to released information, the relevant authorities provided key details on Canadian national Michael Kovrig's case, including how he violated Chinese laws by spying on and stealing state secrets and intelligence. I don't quite see how you find anything illogical with the case involving these two Canadians suspected of violating Chinese laws. As released by relevant authorities, important progress has been made in the investigation of Michael Kovrig's case, and case-handling authorities are still working on it in a law-based manner. Q: A bipartisan group of US lawmakers have complained to the Donald Trump Administration about its response to human rights abuses including that it had not followed through with imposing sanctions. Is China concerned that the US will impose sanctions on Chinese officials over Xinjiang and has it expressed those concerns to the US? A: For some time, certain individuals of certain countries have been playing up issues in China's Xinjiang Uygur Autonomous Region and leveling venomous attacks against the preventive counter-terrorism and de-radicalization measures the Chinese government has taken to keep Xinjiang a stable and tranquil place where people of various ethnic groups live happily together. As I said, people with true insight of the international community and those who have visited this region for themselves have made objective and just statements. We hope the US individuals you mentioned will respect facts and stop such actions that smear other governments and sabotage China-US relations. 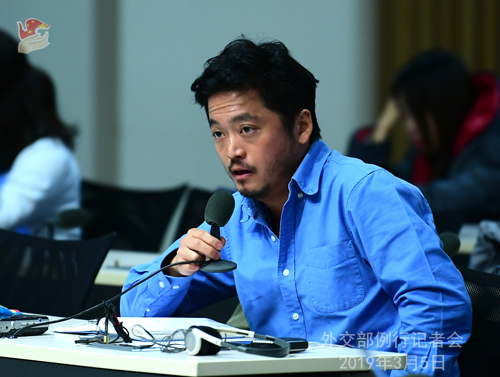 You asked about the Chinese government's position. I would like to emphasize that the Chinese government will remain resolute in taking all measures conducive to improving the welfare of the Chinese people, including people of various ethnic groups living in Xinjiang. Q: Russian President Putin signed a decree yesterday to suspend Russia's obligations under the terms of the Intermediate-Range Nuclear Forces (INF) Treaty and said the hold would remain in place until the US ends its violations of the treaty or until it terminates. Do you have any comment? A: We have talked about our position on the INF Treaty many times. As an important bilateral treaty in the field of arms control and disarmament, the INF Treaty is of great significance to easing major-country relations, promoting international and regional peace, and maintaining global strategic balance and stability. We are indeed concerned that its nullification will have a negative impact on world peace and security. 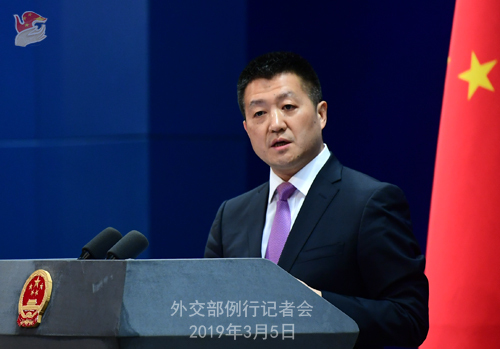 The Chinese side opposes the US withdrawal from the Treaty and urges the US and Russia to properly resolve differences through constructive dialogue and return to compliance with the Treaty at an early date.